One of the reason we bought the 2016 Yamaha YXZ 1000 was for the manual shift. The sequential shift is fun to operate and having control over the clutch gives one more traction control. However, after a few races of slipping the clutch in tight corners it proved to be a little too punishing for the stock clutch plates. So we opted to step up to the GRYT BFC billet friction clutch kit. The kit boasts of better oiling and an increase of 25% more grip on our 1000R model. The SS model is said to gain 33% more grip. Exploded view of how the assembly goes together. Following covers the manual shift 1000R model. 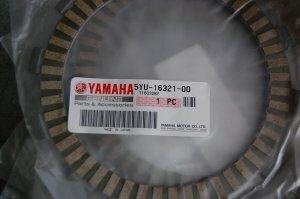 The 1000R SS (Sport Shift) model is similar but uses 8 thicker steel plates not used in this assembly and requires authorized Yamaha Dealers to have the clutch engagement point of the YCC-S System programmed. The GYRT kit (2HC-E6300-V0-00) consist of billet clutch basket, inner hub and pressure plate. It is machined from high grade aluminum then anodized, giving it that high dollar race ready look. And a justifiable look as I found most advertise it for $800. After searching high and low we found one online at Cucamonga Yamaha for $650. But wait there’s more! That price is just for the hard parts. 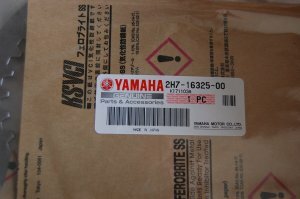 I read that it required 5 extra friction (5YU-16321-00-00) and 5 steel plates (2H7-16325-00-00) and ordered them as well as two quarts of Yamaha lube. With tax and shipping this all came to $835. I thought I had ordered everything, but, realized later, that I needed a total of 13 friction and 12 steel plates to complete the job so I spent another $247. Adding it all up it’s around $1050. Oh ya, I almost forgot, I don’t have a press so I had to have the ring gear ground off the old basket and pressed onto the new clutch basket. Another $40. Anyone that has changed a motorcycle clutch will be familiar with changing out the YXZ clutch. Instructions that come with it are minimal and refer you to the factory service manual so I’ll go over some basics. I have ramps to drive up on and was lucky the cold clutch grabbed enough to get up on the ramps. After blocking the wheels the skid plates were removed. A bunch of grim had to be cleaned off before opening up the clutch cover. 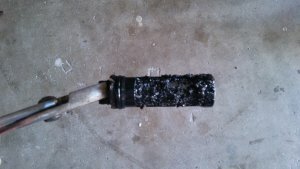 The transmission oil was drained and the transmission filter removed and cleaned. Once drained and cleaned both were replaced. An 8mm socket is needed to remove the clutch cover. Be sure to note the three cover marks indicating where copper washer are needed. With the cover off you can remove the clutch spring retainer bolts allowing removal of the retainer, spring plate, spring plate seat and pressure plate. Make note of the spring plate seat that sets in the outer side of the pressure plate as you will need it during install. 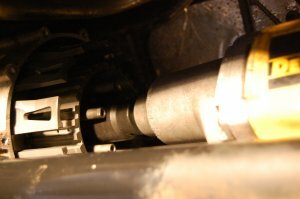 Remove the short clutch push rod and make sure the ball bearing inside the shaft remains. Pull off some of the clutch plates. There is a 30mm nut securing the clutch basket and you need an impact to remove the nut. Once the nut is off the inner hub and clutch basket can then be removed. Keep the 30mm nut and two washers securing the hub for install later. Once the hub is removed it will reveal a thrust washer to be later installed between the basket and hub. 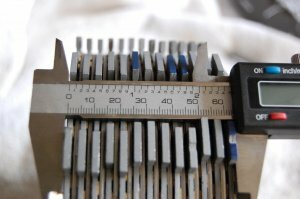 The stock clutch basket ring gear needs to be removed from the basket. I had this done so I’ll just add in the provided instructions. Center punch and drill the heads of the rivets on the back of the basket to remove the stock retainer plate, stock gear and isolators. Note: mark the orientation of the gear, isolators and retainer plate so they can be re-assembled in the same position. 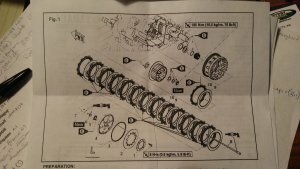 Normal wear can affect clutch performance if these parts are not assembled just as they were before this kit was installed. Press out OE clutch basket rear gear from OE basket. This gear will then need to be pressed back into your GYRT Billet Basket. Install the gear, isolators (text side out), and a Retainer Plate onto you GYRT Billet Basket with 10 M6 x 20mm Flat Head Screw provided. Note: Clean the screws and the threads in the basket with contact cleaner. Apply Yamabond Red Threadlocker (p/n ACC-YAMBD-P2-71) or equivalent to the cleaned screws and tighten to 10Nm-7.4 ft lbs. Since I had the gear swap done by Rudy at Pro Prept in Escondido, CA mine came back with all the screw heads double pinged to ensure they don’t come loose. 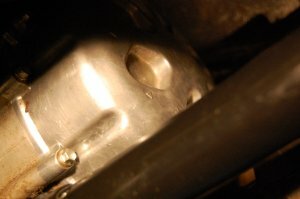 Before installation be sure to remove any gasket material from the transmission case or clutch cover mating surface. And make sure the alignment dowels are still in the transmission case. Installation is straight forward. To check clutch pack height I installed all the plates on the hub and measured that height was the required 63mm. Once I assured myself that I was right I removed the plates and tossed the friction plates into some Yamalube to let the material soak up some oil. Speaking of oil, all the little parts got lubed up before install. To get this project finished I slid the new clutch basket onto the output shaft and seated it on the shaft bearing. The plate thrust washer went on before the hub. To secure the hub a flat washer is installed then the conical spring washer marked “this side out” was installed. A dab of red thread locker was added to the 30mm nut threads and an impact secured the nut. Put some red thread locking compound on the 30mm nut threads and use an impact to tighten it. Once the hub is in you can start stacking the plates, first a friction plate then a steel plate. Keep stacking in that order until the last friction plate is in. After checking the o-ring on the small push rod it can be inserted into the shaft, but first make sure the ball bearing is still inside the shaft. The pressure plate assembly can then be installed with the spring plate seat into the outer diameter of the pressure plate assembly. Place the clutch spring over the spring plate seat then align the diaphragm pressure plate with the pressure plate assembly and install the button head screws provided in the kit. Torque the button head screws to 8Nm-5,8 ft lbs. Place the gasket onto the dowels then position the clutch cover. Install the clutch cover bolts making sure to reinstall the three bolts with copper washers into the holes marked on the cover. reinstall the three bolts with copper washers into the holes marked on the cover. The manual calls for 1.59 qts of oil to be added to the transmission. Once the skid plates were removed all was done from under the vehicle requiring nothing else to be removed. Just to make sure all went well, and no leaks, the wheels were unblocked and the buggy went for a little test drive before returning to install the skid plates.